Why don't you come over to Kyoto,Osaka,Nara with your wheelchair? 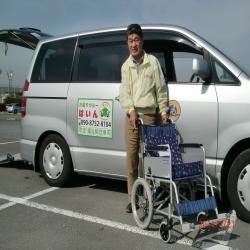 I am an owner-driver of a wheelchair-accesible taxi in Osaka,Japan. qualified by the government,you can absolutely enjoy your trip to Kansai area with ease. Musou Soseki,a Buddhist monk,in the Muromachi period. Please e-mail 27ms-pine.10@maia.eonet.ne.jp by two months before visiting.